Playful- Loves to play around and have fun. Enemies: none, she tries her hardest to not make any enemies. History: Lakepaw is the only daughter of MapleStar the leader of Riverclan, she has three brothers. Lakekit has no clue who her father is as MapleStar would not tell who the father is. As a she was the weakest of her sibling, Lake It thought that her mom was disappointed in with her as she was not as strong as her brothers. But Lakekit did love going over to the medicine cat den and helping sort herbs Mouseleap saw the in her and how badly she wanted to become a medicine cat. One night the camp attacked by a group of rogue Shadow Clan cats. After the battle, Mouseleap asked Lakekit to help her to tend to the warriors that were attacked while she went to go and get some cobwebs. When Mouse Leap leap got back, she found that Lakekit had originated all the herbs for her. When Lakekit was five moons, Mouse Leap received a prophecy “The heart of the water will bring peace to the river and shadows, with a cure that will save the clans.” Mouseleap had no clue what this meant and went by the lake to ponder this prophecy; she found pawprints in the mud the looked to kit pints that lead to a catmint Mouseleap took this as a sing to make Lakekit her apprentice. When she went to talk to Maplestar, Maplestar was adamant that none of her kits would be medicine cats. But when Maplestar was told of the sing given by Star Clan and about the prophecy she still wouldn’t let Mouseleap mentor Lakekit. When it came time for Lakekit to become the whole clan expected for Maplestar to give her kits the best warriors as mentors to her kits. It surprised everyone when Lakepaw didn’t receive Mouseleap as a mentor, not only because as a kit Lakepaw showed interest in being a medicine cat and helping others. For Lake Paw's first moon of training to be a warrior, she was absolutely miserable and hated every moment of it. When Lakepaw was not training, she would hang out with Mouse Leap helping her sorting the herbs or going to find more herbs if need. Lakepaw would bring back more herbs than fresh kill when they went hunting. One night Graywing the medicine cat add the code that all kits must be protected no matter what clan. Visited Lakepaw in her dream teaching her some basic medicine cat things telling her that she will need them. The next day when she is on the portal with her brothers they are attacked by a dog after the mentors get the dog away Lakepaw quickly helped Mosspaw by using the things Grey as he got a really nasty wounded and he was bleeding out very quickly, she was able to save him. With this Maplestar finally gave in and let Lakepaw train as a medicine cat. Even thought Lakepaw was a slow learner she learned very quickly and very anxious she made friends with the other medicine cats very quickly. When LAkepaw when to the moon pool for the first time, she saw Greywing again, and she should tell her these other cats of the prophecy that she was unaware of and she was also shocked to find that there was a prophecy. Other info: The medicine cats of all of the clans received a message about a plague that is coming to the epidemic this is coming to the clans. The sickness is called night sickness (which is based off Feline Panleukopenia (Feline Distemper) ). The medicine cats have to come together to stop this disease. This sickness is killing of kits and another cat very very quickly. The illness was sent to the Clans for a star clan medicine cat named Lightfoot he was well respected until he took at kitty pet as a mate. During his life he watched his get kits and mate be killed, but the ignorances of the other clans the Clans held a trial saying that Bell, Lightfoot’s mate and her kits of terror should be put to death, they all had broken every rule in the warrior code. The kits and their mother were known for trying to attack other cats and claiming false prophecy. His only surviving kit has Fallen Shadow how became a medicine like his father and vowed to stay loyal to his clan unlike his father until he met Malpesplash who was the deputy of Riverclan. 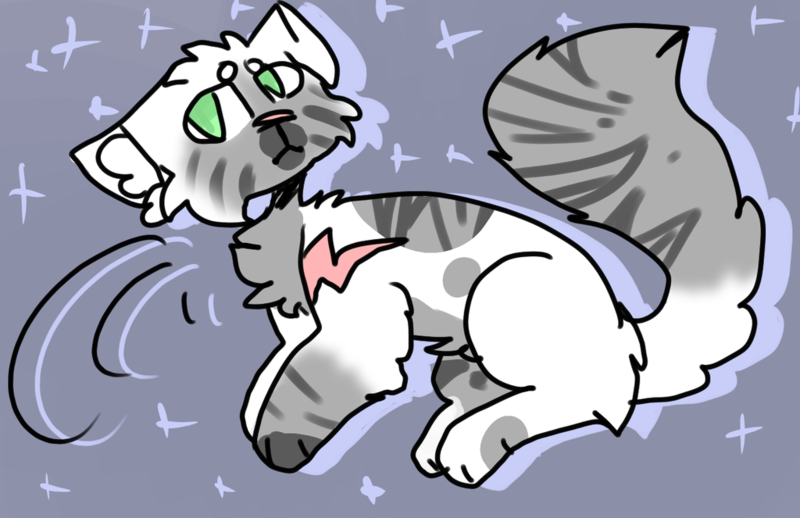 But Lightfoot was angry when he died he when to star clan as no Clan cat ever saw what he did, he was sent to star clan. He could only watch as his true love and kits suffered in the dark forest, so he created an illness that would the clans suffer as much as he had.